TFS, LPA & CTA bookable. 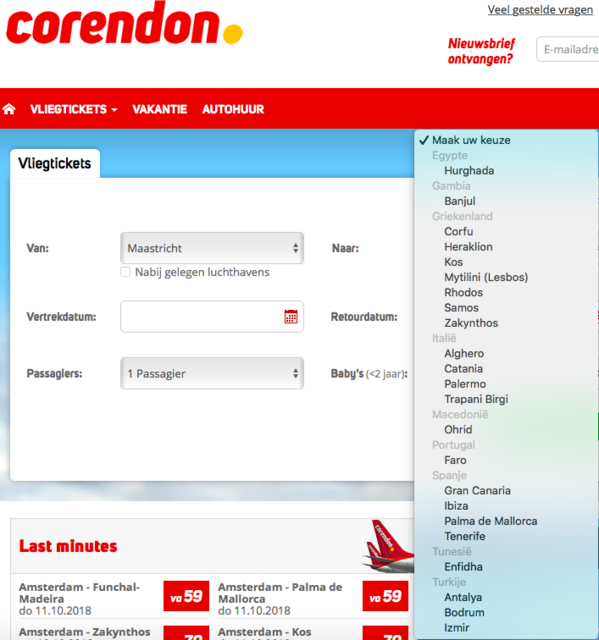 See 'vliegtickets'-section at Corendon website. CFU (Wednesday), ZTH (Tuesday), SMI (Thursday - NEW!) also bookable for S19. RHO (2x weekly), KGS (2x weekly), FAO (1x weekly), HER (3x weekly) & BJV (2x weekly) all bookable for S19, starting in April. AHO & PMO > NEW! bookable, eff. April 19. Potential for Transavia to return to MST in the future: https://www.flightglobal.com/news/articles/transavia-could-axe-the-worst-performing-10-of-dutc-446083/ https://s15.postimg.cc/hxjr8nkwb/Schermafbeelding_2018-09-05_om_17.48.50.png Released yesterday: even some growth at GRQ, but nothing for MST. HRG (Tuesday & Saturday) also bookable for S19.